I met the author, Donna Earnhardt, online in a writers chatroom maybe three years ago when she was still hoping to write the children’s book that would be accepted by a publisher. Well, it has happened! Being Frank is her first picture book to be placed into the hands of eager children, and it is a beautiful one. The story begins with these words: Frank was always frank. “Honesty is the best policy,” he said. While that motto is a very good one, it got Frank into big trouble. Although he knew how to be honest, he didn’t know anything about tact. Eventually, everyone was upset with him, he was being ignored by his friends, and he didn’t understand what to do about it. Enter … his grandfather. Yay! for grandparents! 😉 What he learned from his grandfather Ernest changed how Frank handled his honesty so that he could still be honest but without hurting people’s feelings. Although Being Frank is a story with a moral, it does not come across in a preachy teachy way that could put children off. It is entertaining and funny while getting the point across. A fabulous picture book story falls short when there are not great illustrations to back it up. Well, there is nothing amiss in this book! The characters in Donna Earnhardt’s Being Frank are brought to life through the bright and colourful illustrations of Andrea Castellani. (His name is pronounced An-dray-a.) When my grandson and I read this book together he was busily taking it all in, there is so much to see and enjoy that goes with the words. 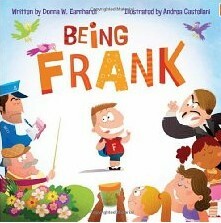 Being Frank by Donna Earnhardt is a wonderful book to add to your bookshelf. You can find Being Frank listed on my BUY THE BOOK! page. This entry was posted in Mostly About Reading, Reviews & Interviews and tagged Andrea Castellani, author, Being Frank by Donna Earnhardt, Books, Children, childrens books with morals, Flashlight Press, illustrator, new author, Picture book. Bookmark the permalink. What a wonderful topic! As a parent I am always telling the kids to “tell the truth” but how do you teach tempering honesty with compassion? This book sounds like a great resource. I am looking forward to the interview. It’s a beautiful book and Donna certainly did a great job putting the message across in an appetizing way for children. Thanks for your comment, Ginny. Having read this book, I can attest to the fact that it is well written and illustrated. I am sure there are many people of various ages who may benefit from reading it!! Oh, I agree … on all counts, Faith. Thanks for your comment. THis looks like a good book for the little people in my life! Then be sure to comment on the interview, Erik. That gives you one chance to win it. We’ll find out who the winner is next Tuesday. Thank you for such a great review, Lynn! Huge hugs!